Mark Calzavara, Christine McLaughlin and Gail Bates (Friends of Oshawa’s Waterfront General Meeting, 1 November 2012). Photo courtesy of Robert T. Bell. I recently wrote about an ongoing struggle in Oshawa around the city’s waterfront – the federally-appointed Oshawa Port Authority (OPA) has approved an ethanol refinery at the harbour, despite longstanding local opposition. The battle over public opinion has coalesced around two polls conducted on this topic. The first, commissioned by the OPA, shows a majority in support of the ethanol plant. A second poll, commissioned by the Council of Canadians, shows a majority opposed to the ethanol plant. I was rather disappointed to read an “analysis” of this in a local paper that reached an immensely disappointing conclusion: “ignore both polls, demand accountability, answers.” There are many valid reasons why two polls can show contradictory results – none of these provide good reason to discount polling entirely, or to ignore any poll. There is no need to demand answers- they are readily available to us all if we just take the time to ask the right questions. The poll commissioned by the OPA was featured at a public meeting it hosted on the ethanol refinery. The public was not permitted to speak at this meeting; instead, questions were to be submitted in writing, and some were selected to be answered. They later posted answers (but not the questions) on their website. This did not stop many in the room from voicing their thoughts: one major concern centred around which geographical area the poll covered. There seemed to be some resistance to explaining exactly what the Oshawa Census metropolitan area encompasses. Given this area stretches well past Oshawa into Whitby, Clarington, and north towards Highway 115 and Lindsay, it is perhaps understandable why proponents of the plant would want to avoid that question. Clearly someone in Whitby, where residents have a harbour they can use, might not feel as passionately about Oshawa’s waterfront as someone who lives there. The first poll was soon countered by a poll commissioned by the Council of Canadians, which revealed a majority of respondents opposed to an ethanol plant on Oshawa’s waterfront. The most basic reason for this difference is quite clear: this poll was conducted among those who live in the City of Oshawa. 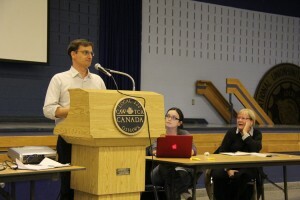 As Mark Calzavara from the Council of Canadians explained when he recently visited Oshawa, not only was an effort made to select telephone numbers from Oshawa proper, but as added insurance, each respondent was first asked if they lived in Oshawa, so that only those who-self identified as residents of the city participated in the poll. There are other reasons the two polls produced different results. They asked different questions. The OPA poll was much longer and more complicated; it provided ten arguments against, and then ten arguments in support of the ethanol plant. Beyond concerns over polls being used as tools of persuasion, critics of the OPA poll have also pointed out that the arguments against the ethanol plant were not nearly as strongly worded as those in support – for example, Second Marsh, Oshawa’s environmentally protected wetland that borders the proposed ethanol site, was not even mentioned in the arguments against ethanol at Oshawa’s harbour. The poll commissioned by the Council of Canadians posed five simple questions. After testing familiarity with the issue, it gauged support for ethanol on the waterfront, finding an approximate 42 per cent disapproval rate against a 37 per cent approval rate. Respondents were then asked: “Regardless of whether you approve or disapprove of the ethanol plant in general, would you say that you approve or disapprove of the plant being located on Oshawa’s waterfront?” Disapproval spiked to 55 per cent while support plummeted to 29 per cent. The second poll does not address the jobs argument that has been spun by supporters of ethanol on the harbour. However, in that hundreds recently lined up for hours to apply for a part-time job at Costco (for a starting wage of $11.50), these results might also be read in a larger socioeconomic context of perpetual job loss in a heavily deindustrialized city. The last question addresses an interesting theme that has deep historical roots in Oshawa: local autonomy. When asked which level of government should have decision-making power about the ethanol plant, only 8.9 per cent thought this should be made at the national level, while 50.8 per cent believe the decision should be made locally; 19.7 per cent thought it should be a provincial matter, and 20.6 per cent opted for a combination of all three levels of government. These results are telling given that this been a federal procedure that has so far bypassed provincial certificates of approval, and ignored the reservations of local government. Although one councillor has broken unanimous opposition, City Council remains overwhelmingly opposed to ethanol at the harbour. Signs opposing ethanol at the waterfront are springing up across the city. Approximately 450 people attended a town hall hosted by Friends of Oshawa’s Waterfront on this issue. While no Conservative MPs or MPPs attended an event that coincided with their constituency week, not one attendee spoke in favour of ethanol at the harbour. You don’t have to look very far in Oshawa to see substantial local resistance to this federal project. But those who live in Ottawa, or even Clarington and Whitby, do need to look pretty far to see what’s happening on the ground in Oshawa. No one is omniscient. We are most directly shaped by our immediate local context. A survey of Canadians would undoubtedly yield a much higher approval rating for an ethanol plant in Oshawa than it would among those in the affected city. These two polls may contradict one another on the surface, but neither poll can be easily dismissed. They simply tell two different stories. One is a regional tale, where people from within and outside the city share their thoughts on the “biggest issue facing Oshawa,” with many respondents opting for the pre-packaged happy ending of jobs and support for local farmers. The other comes from voices within the area immediately affected by these decisions, and reflects much greater apprehension not only with the decisions being made, but also with how these decisions are being made. In this second story, local people appear best situated to make a decision that will have a largely local effect. In some ways, the polls are even complementary. Neither disproves that the majority of people who live in the City of Oshawa are opposed to an ethanol plant on the waterfront. And both stories combined offer an important moral: polling data should never be accepted at face value. It is always critical to find out who is asking what questions and where, because all of these factors will shape the story that unfolds. Thanks are due to Will Thurber (UOIT) for sharing his critical poll analysis skills. Christine McLaughlin is a PhD Candidate in History at York University, a co-editor of ActiveHistory.ca, and a member of the steering committee of Friends of Oshawa’s Waterfront. So who in the dissenting councilor?